By combining the KEW POSEIDON 7 and state of the art "on demand" tankless water heater technology", AaquaTools has developed possibly the most powerful, energy efficient and cleanest burning portable hot high pressure washer available today. 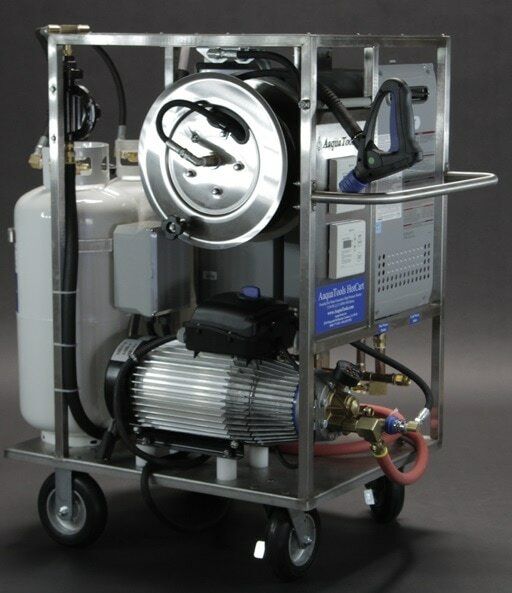 Assembled on a robust, stainless steel cart with locking casters and a 50' hose reel, the HotCart can produce flow's up to 13.2 GPM, and instant hot water up to 180°F. The choice of the North American Wine industry since its introduction in 2004. Ideal for indoor and outdoor cleaning. Often used in caves when adequate air circulation is present. The ultimate heavy duty portable electric cold water pressure washer. Perfect for intense cleaning with high water flow (5.5 gpm) and high water inlet temperature capabilities (185°F). The choice of the North American wine industry due to its outstanding performance and reliability history with literally hundreds in service. The Poseidon is often combined with in-plant hot water systems to perform as portable electric hot high pressure washer. The Neptune 7 combines low running and maintenance costs, ease of use, low noise and high efficiency. It is the most effective and durable partner for heavy duty, industrial cleaning when utilizing diesel or kerosene as your fuel source. The Neptune 7 features the Poseidon 7 pump and motor assemblies. Designed to replace the KEW 5003VA which was the standard for portable electric high pressure washers previous to the AaquaTools HotCart in the North American wine industry.